Just because the space you have for your TV is 55", make sure you know how big it really is. In other words, before you head out the door to get that great flat screen TV deal with the ad in hand and cash in pocket, make sure it's the size you think it is. Here are the TV measurements you need to know. Frame/Bezel Dimensions with and without provided stand for platform vs wall mounting. The space your TV is going to be placed in. When you see an ad for a TV, the screen size is what stands out the most. The promoted screen size refers to the diagonal length stated in inches. Diagonal length is measured from one corner to the opposite corner of the screen surface (bottom left to top right or top left to bottom right). However, the publicly promoted diagonal screen size does not always reflect the actual viewable screen size. To combat accusations of false advertising for flat screen TVs, the term "class" is often used. This means that an advertised TV might be referred to as a 55-inch "class TV". The reason for this is that the frame/bezel needs to cover a small portion of the panel in order to secure it. Listed below are examples of standard total diagonal screen size versus actual viewable diagonal screen size (all sizes represented in inches). Although the diagonal screen measurement determines the relative TV screen viewing area, it doesn't tell you precisely if the TV will fit within a given space. You also need to take into account the actual width and height of the entire TV frame, bezel and stand. Frames/bezels can add anywhere from 1/2 to 3 inches to the width and/or height of the TV frame and the stands add several more. Stands also add more depth. What this means is that whether you are ordering a TV online or before going to the store, make sure you note the listed size of the entire TV, which not only includes the screen but the frame/bezel and stand. If you have some TV brands and models in mind, most manufacturers post both TV product and package dimensions on their web pages. 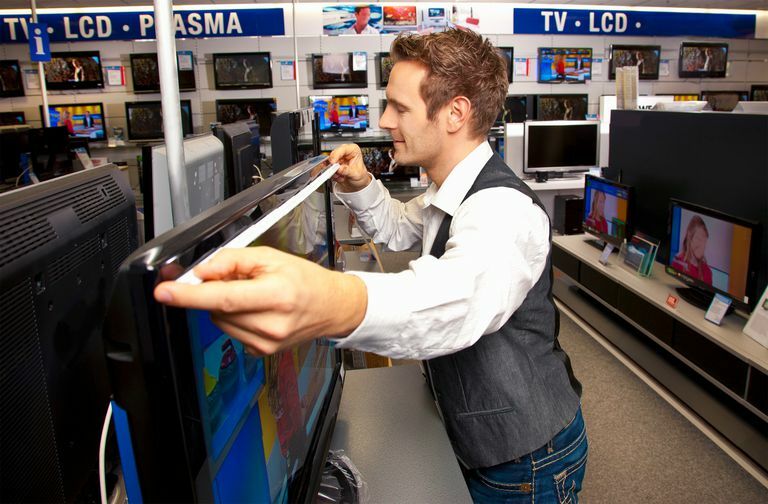 However, even if you have that information in hand, if you are going to a store to purchase your TV, take a take a tape measure with you in case the TV is on display. You can then check or confirm the entire exterior dimensions of the TV. If the TV is not on display, but only in a box, check the box for any listed specifications regarding the size of the TV with, and without its stand. Knowing the size of the entire TV provides the information of how much space it needs for placement, but you need to make sure that you have also measured the width and height available of the space that your TV is going to be placed in. If the TV is going in an open space or on a wall, the main consideration is that there is space for the stand and the wall space doesn't have any borders you may have to contend width. However, if placing your TV in an enclosed space, such as an entertainment center, be sure to leave at least a 2-to-3 inch space on both the left and right side as well as the top and bottom (including the stand) of the TV so it can be safely and easily move in and out of place. It is also a good idea to connect everything to your TV before moving it into place, as the TV connections may be located on both the back and sides of the TV. Don't forget to take both your recorded measurements and your tape measure to the store with you. In addition to measuring the TV and space it is going to be placed in, it is also important to take your seating distance and viewing angle into consideration. Watch Out For Tipsy TVs! Are You Cleaning Your Flat Screen TV or Computer Monitor Correctly? Should You Get a Projector or a TV for Your Home Theater?